(G)I-dle, one of the most promising K-pop girl bands of late, returned with their second album on Tuesday, seeking to repeat the success of their debut record. The second EP, “I made,” marks the six-piece band’s major effort to take the lead in the K-pop scene following their debut year in 2018. 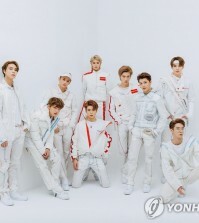 Its debut EP, “I Am,” earned them several rookie trophies from events including the Golden Disc Awards, the Asia Artist Awards, the Melon Music Awards, as well as the Best of Next award at the Mnet Asian Music Awards. It ranked as high as No. 5 on Billboard’s World Albums chart while its track “Latata” peaked at No. 4 on Billboard’s World Digital Song Sales chart. This makes (G)I-dle a rare mainstream K-pop girl band that produces its own music. Girl band (G)I-dle showcases their new song “Senorita” at a media event on Feb. 26, 2019. “Senorita” is a colorful, Latin music-inspired song with a matching Tango-laced performance staged by the six members in Tango-style dresses of different colors. The EP also includes “What’s Your Name,” an EDM number and “Blow Your Mind,” an R&B song jointly composed and written by another member, Minnie. It was her first own music release. “I will be presenting my first composition, which I created with producer Flow Blow. I think the R&B music goes well with the alluring voices of the team members,” Minnie said. The band self-filmed the music video of Minnie’s song in the United States, according to the members. “Watching Soyeon work for her songs, I have been heavily influenced by her,” she added. Soyeon said every track of the EP, even a very minor word in their lyrics, have been carefully taken care of. “Releasing just a single song makes me nervous, but releasing four songs makes me even more nervous,” she said. 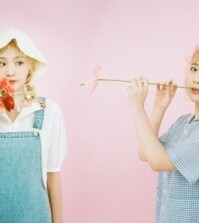 After making two solid hits out of “Latata” and “Hann” last year, the members said they are confident of scoring another hit with the new release.